Zion National Park. One of those parks we’d heard of, again and again, and always figured we’d end up there. But… we hadn’t quite realized just how close it is to Las Vegas (only 2.5 hours away by rental car). Let’s back up. Despite this being March 12th, this post is our 10 on 10 for the month. (Not sure what I’m talking about? Click here to see the first month and learn a bit more about the 10 on 10 project, and click here to see all of the posts to date.) Since we’re a bit tardy, we’ve included two extra shots– so we’ll call this a 12-on-12. Our apologies, this annual trip to Las Vegas for WPPI (an enormous wedding and portrait photography convention) is generally the best way to wipe all of our spare time off the calendar, and the 10th happened to fall on the date we were traveling home. This month Courtney added a new component to the challenge: incorporate “small” as a concept into the images somehow. As soon as we heard that we decided that this day trip into Zion would be perfect; these towering cliffs certainly make us feel small! Alright! Back to Zion. We’ve heartily embraced seeing our National Parks in the past year, which seems timely considering 2016 is the centennial celebration of the NPS. All this beauty, all this space, and it belongs to us? Yes please. Count us in. 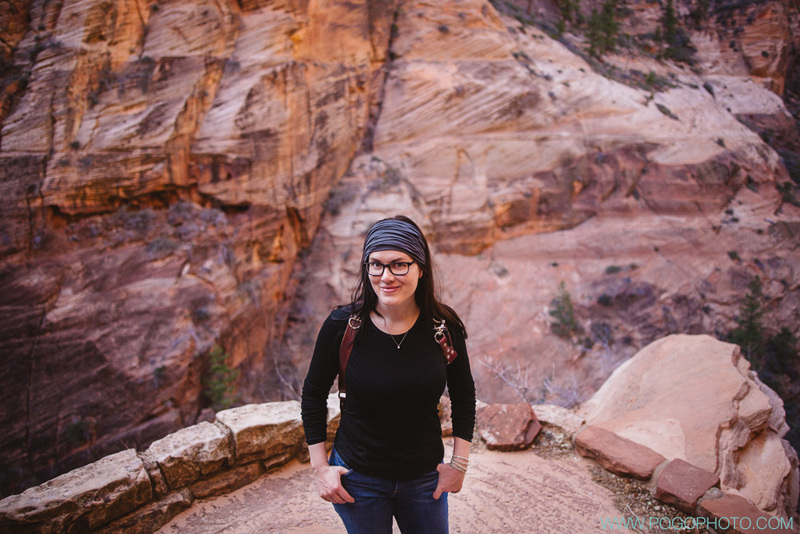 Once we realized that Zion is a short hop away from Las Vegas, we opted to arrive a few days early for this year’s convention, and spent some time breathing fresh air and hiking dusty rocks before the glitz, glitter, and pointy shoes of Vegas. Quite the contrast! 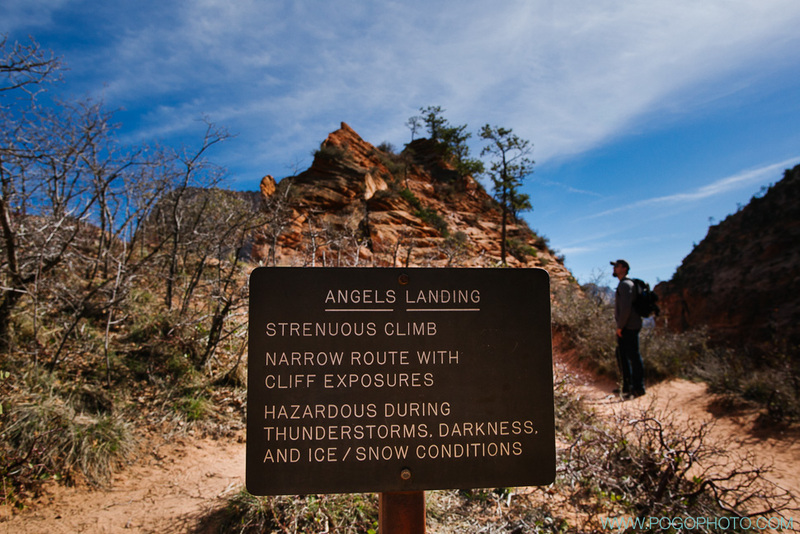 While studying the Things One Must See and Do while in Zion, we learned of Angels Landing, a “strenuous climb” as their own sign puts it. 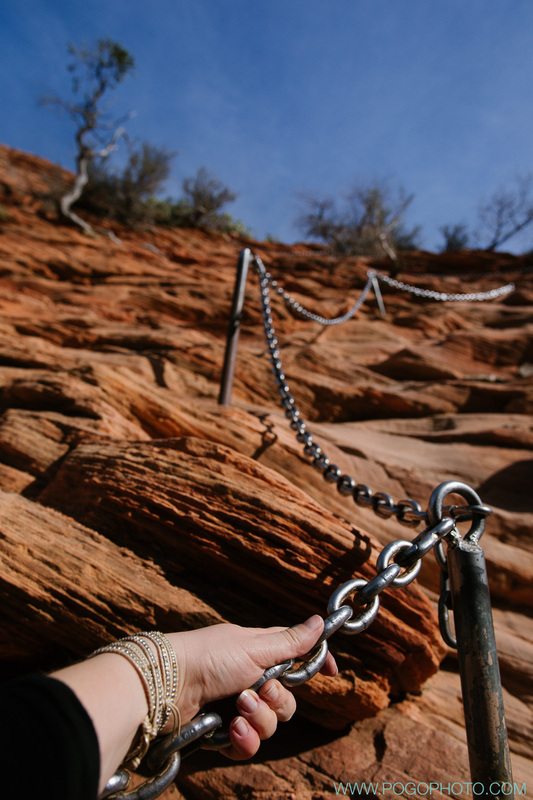 This might be understating it a tad; there are parts where you have to cling to a thick chain anchored to the cliff walls and hoist yourself up and down to get to the summit. 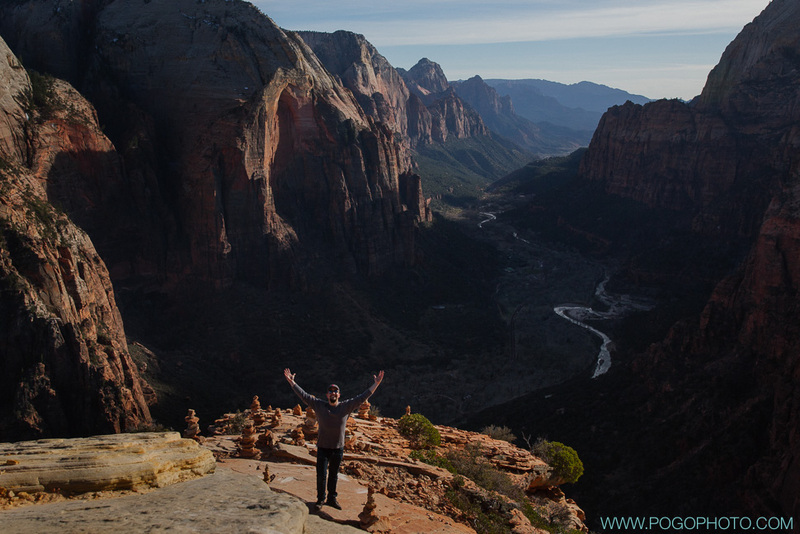 The best description we read (and can’t seem to find, but we’ll figure out the source later) was that Angels Landing is “either the National Park System’s most difficult hike… or its easiest climb.” Which seems perfectly accurate, in our experience! It starts as a steep but easy hike up mountain switchbacks, quickly gaining in elevation, with a respite from the heat in Refrigerator Canyon, a fun zigzag up Walter’s Wiggles, and then the most memorable 0.5 mile “hike” we’ve ever heard of. The long and short of it? 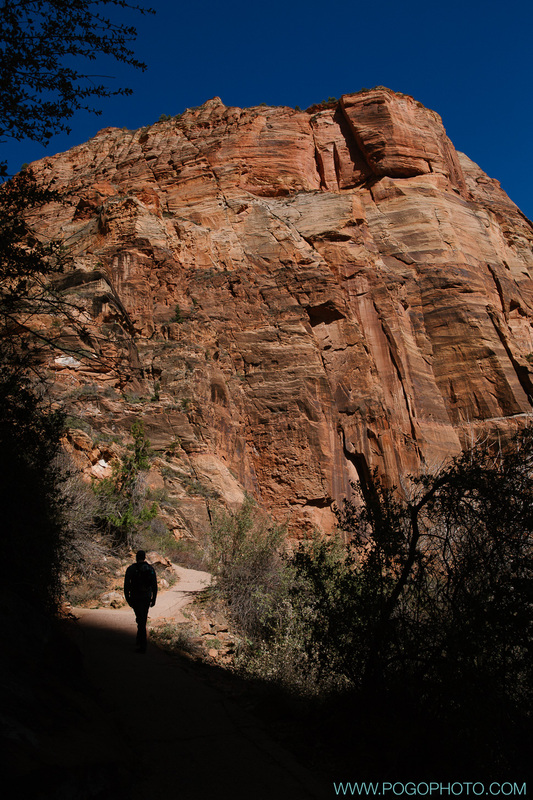 Yes, it’s potentially quite dangerous: sheer 1500′ drop-offs on either side of the path, which is sometimes as narrow as two feet wide; slippery sandstone that can let shoes slip; tight spots where it can be hard to pass other hikers. 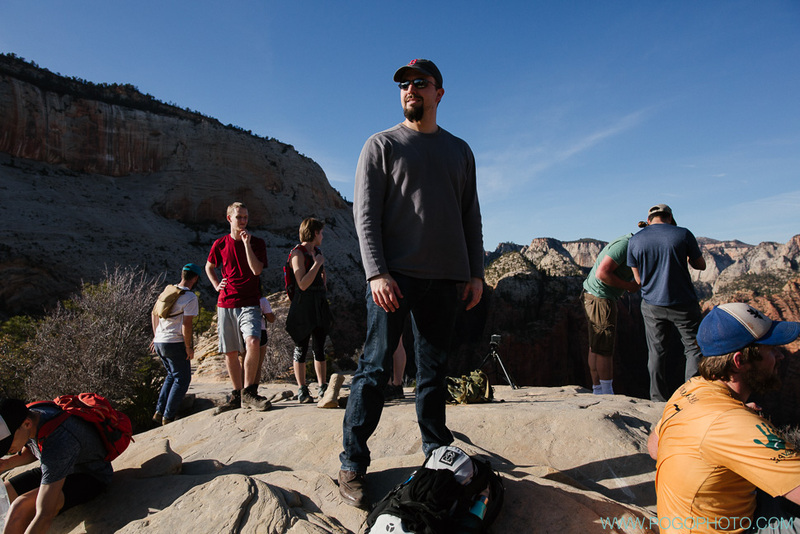 Overall this is a hike we’re glad we did in the off-season, as summer can not only be brutally hot in Zion, it’s also insanely crowded. We hit the perfect window: the snow was gone and it was warm, but the masses hadn’t yet shown up. As two flatlanders who are pretty inexperienced in strenuous hikes, this was challenging, but not impossible. The best advice we were given? “Take as much time as you need.” We did, and we had an amazing experience. 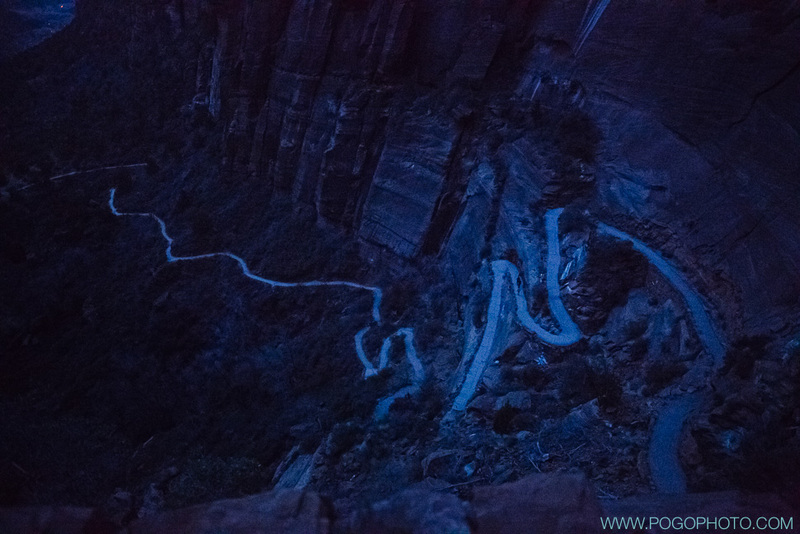 Halfway up Walters Wiggles, a series of 21 steep switchbacks to squiggle up the mountainside. 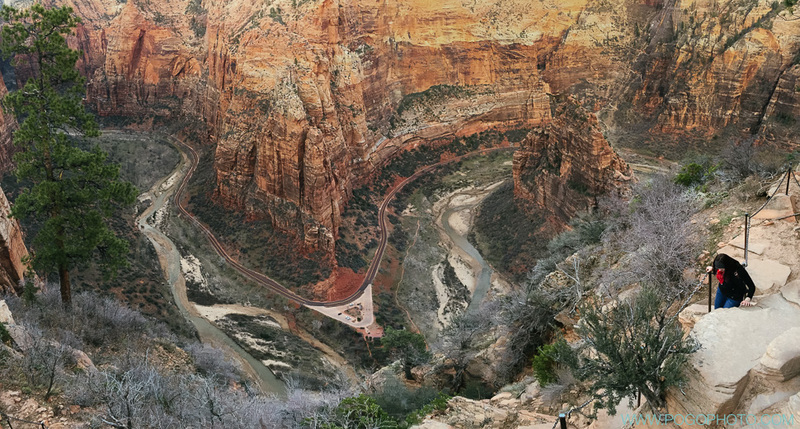 A pano from Scout’s Lookout (where people who aren’t fond of heights often wait for their friends to return–or not– from the last climb to Angels Landing). Yep. That narrow spine on the right? That’s what you hike up. Well, hike is not quite the word. See below. A view of Big Bend. We later photographed the stars from that parking lot! So this. This is why people climb up here. BREATHTAKING. It got a bit dark on the way down. And by “a bit dark”, we really mean “dark as a moonless night”, which it was. Luckily our cameras have super vision, so we got this cool shot of the squiggling path. For any gear geeks and shutterbugs out there, this was shot on a Canon 5D Mk iii with the Sigma 24-35mm at 24mm, ƒ2.0 for 1/30th of a second, at ISO 25600. (Yes. 25600. We legitimately couldn’t see the hikers on the path with our eyes, but the camera picked them up!) And yes, we had headlamps for the rest of the walk. And the stars. The stars were amazing. This place is truly DARK! 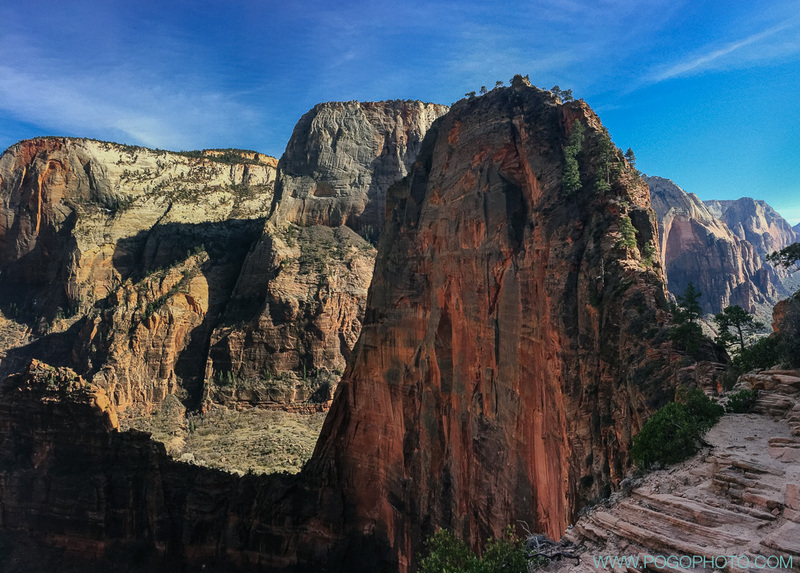 Here’s what we assume is Angels Landing (could be wrong, but haven’t researched it enough yet) from Big Bend (the parking lot you can see in the pano a few images back). 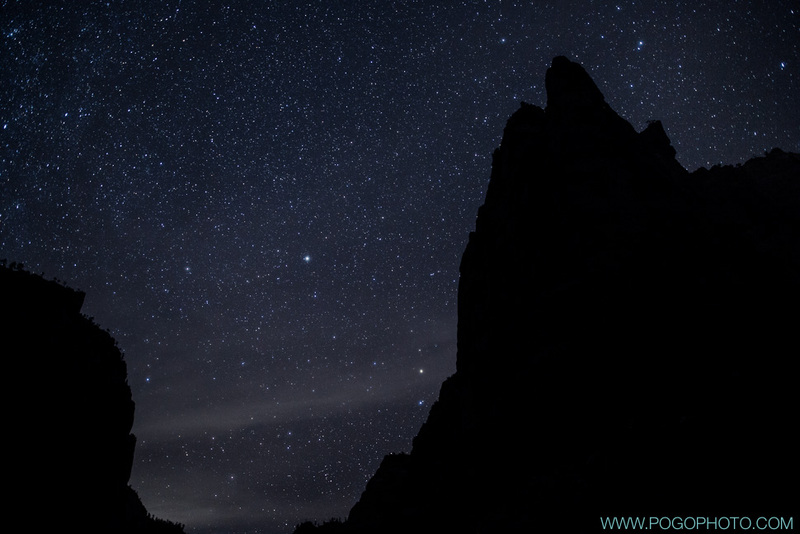 It was big and pointy in the night sky anyway, and we thought that was fun. Wow! What a hike and part in the dark no less. Yes it is breathtaking, great photos you two. Awesome photos, Pogos! And what an enticing place to visit! Love the stars shot.